If you are a reader of this blog or our sister websites such as www.90254RealEstate.com, www.90277RealEstate.com, or www.socalistings.com, you should know that we are huge fans of modern, architectural and loft style homes and we often don't see enough of these the South Bay and at the Beach in particular. But what's cooler than steel and glass, an ocean view, the sound of the waves and the Strand just a stone's throw from your front door? Surf's up, side out. 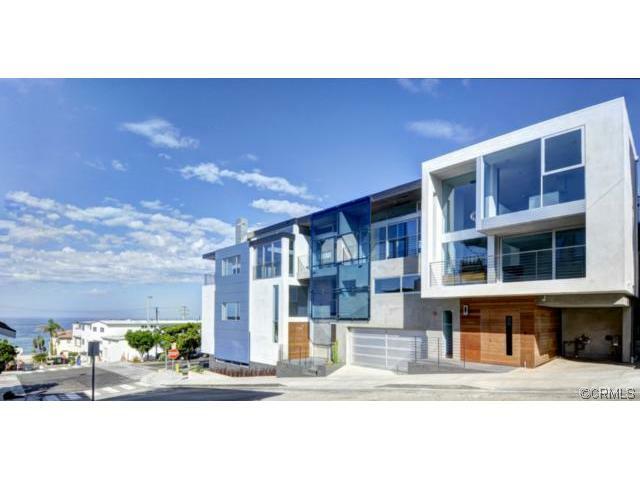 If you are looking for an architectural masterpiece located just one block to the beach in the heart of downtown Manhattan Beach, 1402 Manhattan Avenue, Manhattan Beach CA offers whitewater, ocean, Pier and Palos Verdes views. The large open floor plan is enhanced by over sized glass doors allowing the entertaining rooms and den to be completely open to the viewing decks. Three bedrooms, four bathrooms, generous living, dining, and kitchen areas plus a media room and a floating office exceed expectations of the most sophisticated buyer. State of the art solar panels and radiant heating add to the value of this home. Approx. 2400 square feet with plenty of parking for you and your guests. MLS S12111904. Click here to view the listing then call 310 975 5139 for more details. For more Manhattan Beach Real Estate, follow this link. Interested in other homes in the Manhattan Beach Sand Section? Here's everything for sale in the Manhattan Beach Sand Section, Manhattan Beach Hill Section, Manhattan Beach Tree Section, and Manhattan Village or simply house hunt the Manhattan Beach Multiple Listings yourself.